Size: Phyllocarid is almost 7 inches long! This is a spectacular example of an extremely rare fossil. It is a phenominal Phyllocarid, Nahecaris stuertzi, from the old roofing slate quarries of Bundenbach, Germany. This specimen came to us from a 30-year-old German collection, as the locality has been closed for years. 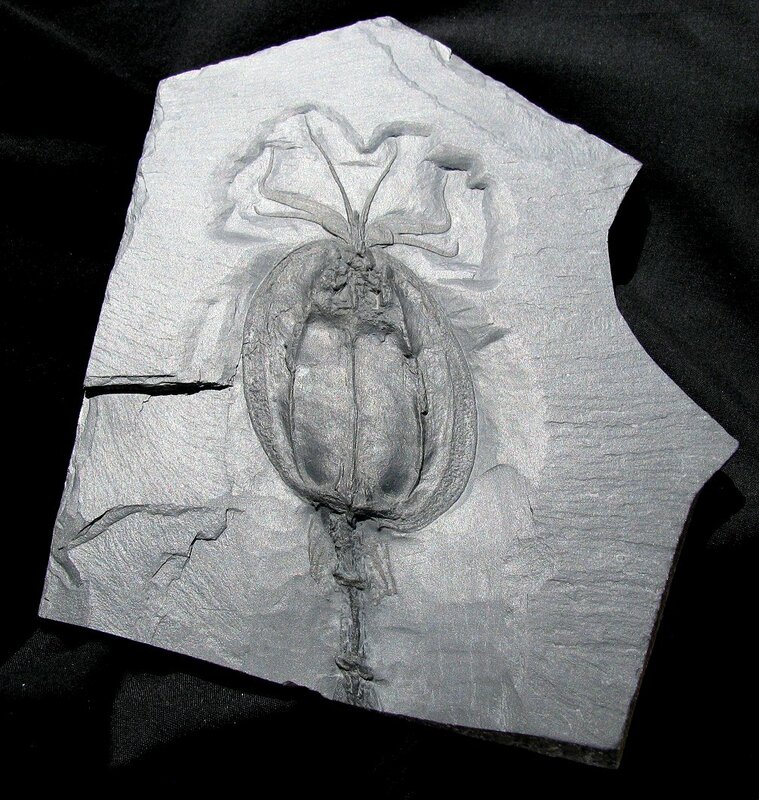 Phyllocarids are extinct, shrimp-like invertebrates, a rare and enigmatic family of arthropods. Occasionally, pieces or parts of phyllocarids are found at sites like the Burgess Shale, but complete examples are almost unheard of. This specimen is nearly complete, missing only the ends of the three tailspines. The detail is extraordinary - the bulbous eyes and flowing antennae are beautifully displayed. Even the appendages preserved at the back end of the carapace (very rare!). The HUGE carapace itself also has excellent detail intact. The organism is close to the bottom edge of the plate, but, overall, it is very well displayed on the shingle of roofing slate. This is easily the most detailed example of a Nahecaris stuertzi Phyllocarid that we have seen. It is a textbook specimen of this rare, eclectic animal that is almost never found with complete soft parts in the fossil record.